As nations emerged, their rulers needed more than an ability to punish people to hold their countries together. They needed their citizens to feel a loyalty to the nation, and they also needed people to accept their rule as legitimate. In Europe, some philosophers and kings asserted the idea of “divine right,” claiming that just as God had given priests and preachers authority over churches, he gave kings and other royalty—as well as their descendants—control over nations. It’s not surprising that people of royal descent latched on to this idea. If people believed rulers were appointed by God, they would be less likely to revolt, and more likely to obey. The American colonists cried "No taxation without representation" when the British began taxing colonists for items like tea. 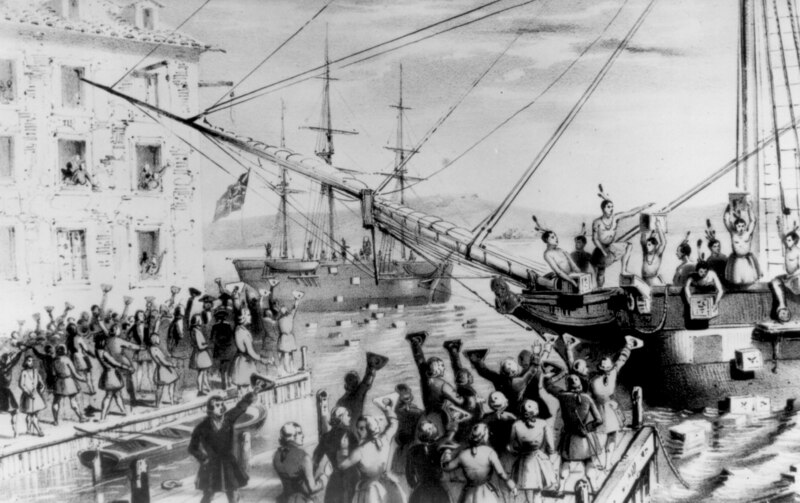 This painting depicts the Boston Tea Party where Patriot leaders disguised as Native Americans dumped tea into Boston Harbor. Government is formed with the consent of the people, and representatives are elected to govern. Ultimately, whose responsibility is it to ensure that the government changes its behavior if it becomes destructive? What does “consent of the governed” mean? The representatives give power to the government through elections. The people give power to the government through their representatives. The government gives rights to the people through laws. The government gives rights to the branches of government through separation of powers. Monarchs get their power to rule from God. Governments get their power to rule from God. Monarchs get their power to rule from the people. Governments get their power to rule from the people. What is the best comparison between a direct democracy and a republic? In both a direct democracy and a republic, individual citizens personally represent themselves in the government. In a direct democracy, individual citizens personally represent themselves in the government. In a republic, citizens are represented by elected officials in the government. In a direct democracy, citizens are represented by an executive council. In a republic, citizens are represented by a monarch. In both a direct democracy and a republic, citizens are represented by elected officials in the government.